PEOPLE OF THE INTERNETS! This message goes out to all ye dwellers of the greater Birmingham, Alabama area, which, I’m pretty sure, now includes approximately 4,242 cities, town, and/or municipalities — or, if ye dwell not in one of the approximately 4,242 cities, towns, and/or municipalities that make up the greater Birmingham, Alabama area and have been itchin’ to take a bitchin’ road trip, this message is also for you. 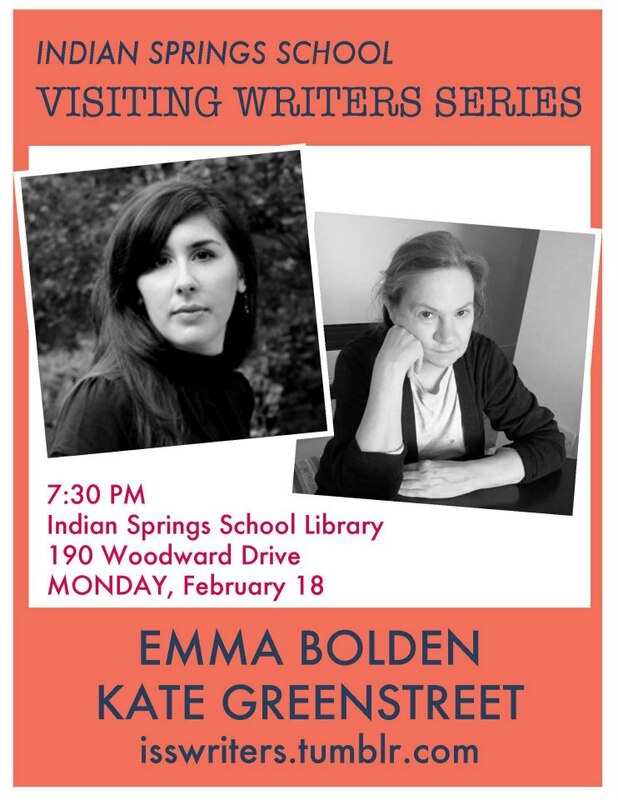 For lo, soon Emma Bolden will board a plane and take to the skies on her way to her olde stomping groundes, where, on Monday, February 18th, at 7:30 PM, she shall participate in the Rock Awesome Indian Springs School Visiting Writers Series. It’s free and open to the public, and you can find out more about it here. She’ll be reading from her book, Malificae, forthcoming in April from GenPop Books. She’ll also be reading with Kate Greenstreet and trying not to pass out from the sheer awesome of being in the same room with her. There will be poems. There will be poems about witches. There will be awkward jokes and swigs from water bottles. And there will be KATE GREENSTREET. PEOPLE THIS IS ACTUALLY HAPPENING. For a preview of poems from Malificae, you can go here and here. To hear what these poems sound like when Abraham Smith reads them, go here. To hear what these poems sound like when Emma reads them, go here. To pre-order Malificae, go here. And for a preview of why Emma might pass out from the sheer awesome of being in the same room as Kate Greenstreet, go here and look at everything. Seriously. Just be careful and put down a pillow or something for when you pass out.